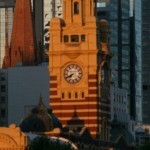 Clocks at Flinders St Station, restaurant bar and gaming venue, is in the heart of the city. They also have heart in their work. Chaplains Without Borders now delivers Chaplaincy services to this central Melbourne venue for club workers and guests! Clocks used to get wound up, but not any more… now they’ve got someone to talk to about it.